GeoNet is so much more than forums. What is one of the best things about the Esri User Conference? It's all the great people you meet, the friends you make, the insights you gain. Wouldn't it be terrific if you could meet and stay connected wi`th other GIS folks from all over the world all year long? All the networking, collaboration, knowledge sharing, and product support you find at the conference is now combined into a single community that spans the globe: GeoNet. 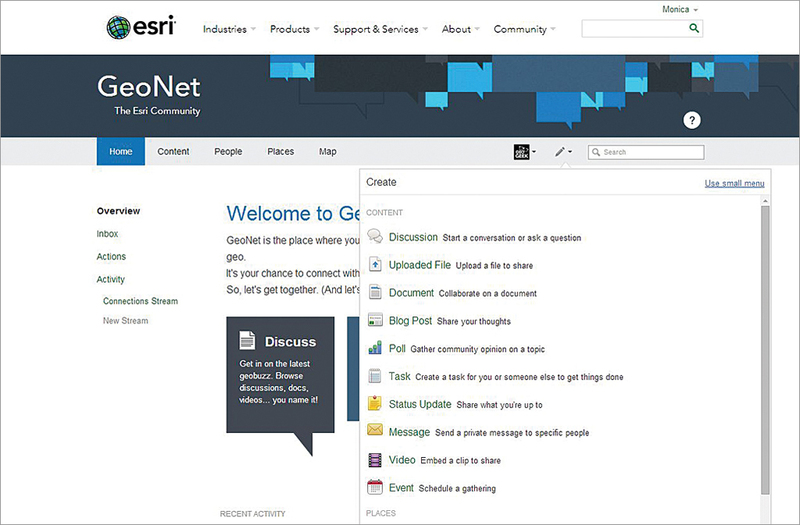 Announced by Esri president Jack Dangermond during the User Conference Plenary Session, GeoNet is not just a collection of forums. It's a tool to help you get your job done more effectively and efficiently (and more enjoyably). At GeoNet, you can create discussions, upload files, collaborate on documents, share videos, write blog posts, and do other things. Of course, the Geo community is mapped. ArcGIS Online is integrated with GeoNet. You can embed publicly shared maps as a thumbnail that is linked to the live map. Esri seeded this general platform with spaces focused on industries and products, but you can extend GeoNet to meet your needs immediately by defining a new group. Since its soft launch a couple of months ago, new groups, such as GIS and E911, Cambodia GIS Users, and Facilities GIS User Group, have been added. It's easy to get started. Just log in with your ArcGIS Online account or create one. Next, update your profile, create custom streams, and begin searching for the topics and people that interest you. Head to geonet.esri.com and keep the party going.